Coffee Tag @ Ipoh, Malaysia - Always Travelicious ! 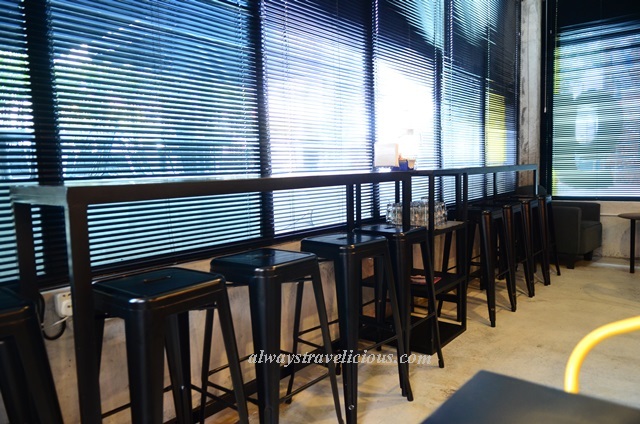 Coffee Tag is another new place to enjoy coffee in a simplistic industrial chic outlet in Ipoh Garden South. Coffee is the main thing here with some adventurous coffee concoctions like durian coffee and nutella coffee. There are even more choices for coffee than food. I had a difficult time trying to decide to go with the durian coffee or nutella coffee (alsoknown as “Naughty” Coffee in Coffee Tag). In the end, I went with durian because it’s seasonal and nutella will always be waiting. Durian coffee (RM 10) is extremely intricate, with flavors of pungent and creamy durian intertwined with a fairly robust coffee brew. Chicken curry with bread (RM 14) is not too bad. The bread is sliced delicately with a pleasurable chewy texture, whether eaten on its own, or dipped into the chicken curry and mopping up the curry sauce. The bread reminisces weakly of a French baguette but it’s not quite there yet as the crust still needs to be crispier. The curry is a tad too mild with scant chicken pieces. Banana chocolate chip muffin is all cute and lacey, presented in a cup with alternating blue strips. It’s light and fluffy, hardly sweet with the chocolate chips being the major contributors of sweetness while almond slices add a crunchy texture. The banana flavor could have been stronger for this otherwise lovely dessert. Other seating areas in Coffee Tag. Overall a pleasant place for coffee which I wold go back again considering their coffees are not too pricey within the range of Rm 5.5 to Rm 10. The food has plus and minus points with the overall tastes and flavors being too mild. Address : Lot 5G, Ipoh Garden Plaza, Jalan Sultan Azlan Shah Utara, Taman Ipoh Selatan, Ipoh, Perak. Opening Hours : 10 am – 6pm. Closed on Wednesdays.